Home / Pattern Reviews / The Paola Turtleneck Tee. Although the wonderful Summer that we were treated to may be over now, let’s face it, Autumn brings with it all sorts of loveliness – namely the opportunity to dig out your favourite comfy knits and snuggle up. This is The Paola Turtleneck Tee from Named. It’s a semi-fitted turtleneck, and an essential wardrobe builder. I made my first back in March this year, as part of the #2018makenine challenge and then promptly forgot to blog about it. I used a medium weight knit fabric which was the end of a bolt from Material Magic in Leicester. It has irregular grey stripes on a cream background and it is soft and warm. I did wonder if this fabric would be slightly too heavy for a Paola, and this reflects in the fact that the neck piece is not terribly ‘slouchy’. As it turns out, I do like the structured finish of the neck and it is a super cosy top to wear on a cold day. It’s the quickest, easiest top to rustle up, and I had mine cut out and sewn up in an afternoon. I enjoyed the instructions (this is my first Named make), which were accompanied by black and white drawings. The finished garment measurements were accurate and I had no fitting issues – the joys of working with jersey! To stabilise the shoulder seams, I used some ribbon instead of the suggested clear elastic. This works for me, as I have lots of ribbon and like to save my elastic for other projects! Small point – it does mention in the instructions to press the shoulder seam allowances towards the front, but I pressed them towards the back. What a rebel! I used a combination of the overlocker and regular sewing machine for this top. For the shoulder and side seams I used the overlocker, and for the collar I used a regular sewing machine (I find I have more control with jersey neckband attachments like this), and then finished off with the overlocker. 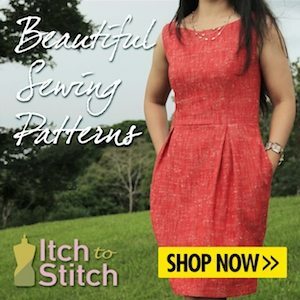 The hem and sleeves are turned under with a twin needle again on the regular sewing machine. So now that we are into October I was keen to make the top again, but in a more lightweight fabric. I am so glad that I did. Check out this adorable floral jersey from Girl Charlee UK that I have had in my stash for a few months now. At the time of writing this I can see that their website shows that they only have 5 metres left, but there are loads of pretty alternatives. It’s adorable and has purple, red, blue and peach flowers set against an ivory background. It’s a rayon blend jersey, which I notice is the fabric type that Named have used for the sample on their website, and it’s perfect! It’s no secret that I am a huge floral fan, and I am so looking forward to wearing this with jeans, skirts, culottes and pinafores this Autumn/Winter. It’s super soft against the skin and the collar is soft and drapey. I think this pattern has worked well with both fabric weights, each having their own different look, and there is a place for both in my wardrobe. At some point I do plan to make a Freya Top from my Tilly and the Buttons ‘Stretch’! book. I like the funnel neckline on the Freya and since I made the Freya Dress I have been meaning to make the top version. I’ll let you know when I do. 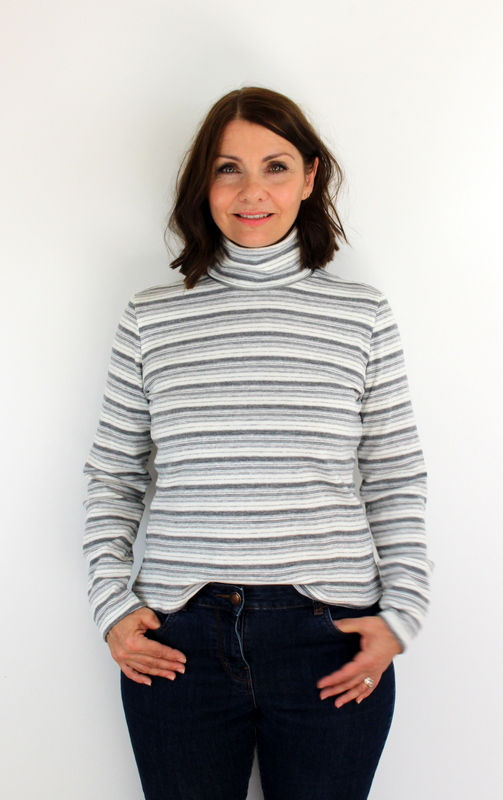 Another funnel neck top pattern that I have made a couple of versions of is the Christine Haynes Piper Top. So, to round up, the Paola is a super little pattern. I love these tops. They are quick to make, super simple and use very little fabric (less than 1.5 metres of wide fabric). Next post: A Tilly and the Buttons Delphine Skirt – the first of many. These are both lovely and perfect for autumn. I especially like the fabric of the first one.